Biotinylated Human 4-1BB, Fc Tag (41B-H82F7) is expressed from human 293 cells (HEK293). It contains AA Leu 24 - Gln 186 (Accession # NP_001552.2). The protein has a calculated MW of 45.7 kDa. The protein migrates as 55-60 kDa under reducing (R) condition (SDS-PAGE) due to glycosylation. 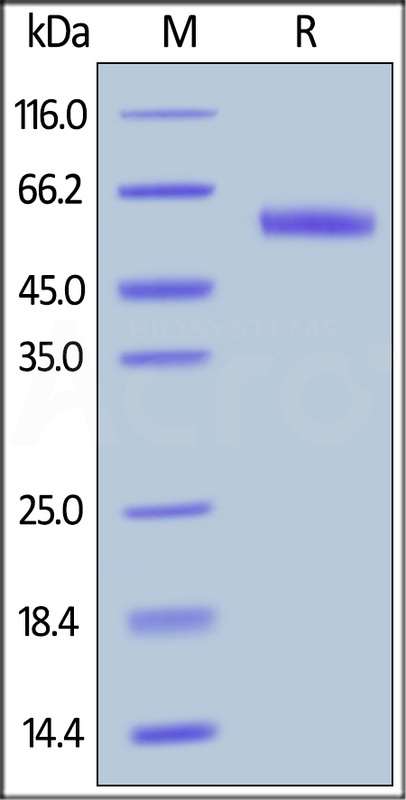 Biotinylated Human 4-1BB, Fc Tag on SDS-PAGE under reducing (R) condition. The gel was stained overnight with Coomassie Blue. The purity of the protein is greater than 95%. Immobilized Human 4‑1BB Ligand, Fc Tag (Cat. No. 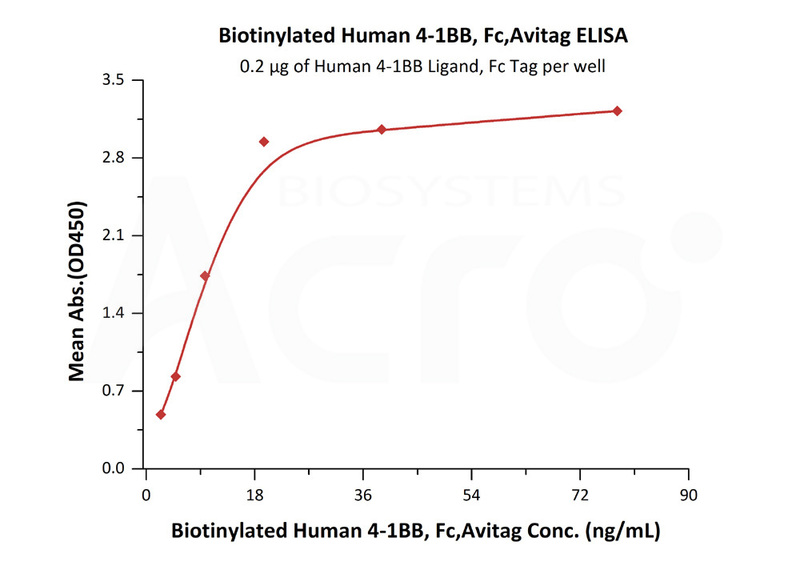 41L-H5257) at 2 μg/mL (100 μL/well) can bind Biotinylated Human 4-1BB, Fc Tag (Cat. No. 41B-H82F7) with a linear range of 2-19 ng/mL (QC tested). 4-1BB is also known as CD137, tumor necrosis factor receptor superfamily member 9 (TNFRSF9), induced by lymphocyte activation (ILA), is a co-stimulatory molecule of the tumor necrosis factor (TNF) receptor superfamily. CD137 can be expressed by activated T cells, but to a larger extent on CD8 than on CD4 T cells. In addition, CD137 expression is found on dendritic cells, follicular dendritic cells, natural killer cells, granulocytes and cells of blood vessel walls at sites of inflammation. The best characterized activity of CD137 is its costimulatory activity for activated T cells. Crosslinking of CD137 enhances T cell proliferation, IL-2 secretion survival and cytolytic activity. Further, it can enhance immune activity to eliminate tumors in mice. CD137 can enhance activation-induced T cell apoptosis when triggered by engagement of the TCR/CD3 complex. In addition, 4-1BB/4-1BBL co-stimulatory pathway has been shown to augment secondary CTL responses to several viruses, and meanwhile augment anti-tumor immunity. 4-1BB thus is a promising candidate for immunotherapy of human cancer. CD137 has been shown to interact with TRAF2. (1) Cooper D, et al., 2002, Eur. J. Immunol. 32 (2): 521–9. (2) Jang, I K., et al., 1998, Biochem. Biophys. Res. Commun. (UNITED STATES) 242 (3): 613–20. (3) Arch, R H., Thompson C B., 1998, Mol. Cell. Biol. (UNITED STATES) 18 (1): 558–65.